My name is Gianna Andrews, but feel free to call me “G”. I prefer to think of myself as a nomad, however I am currently sharing my art and story with the world from the Olympic Peninsula. 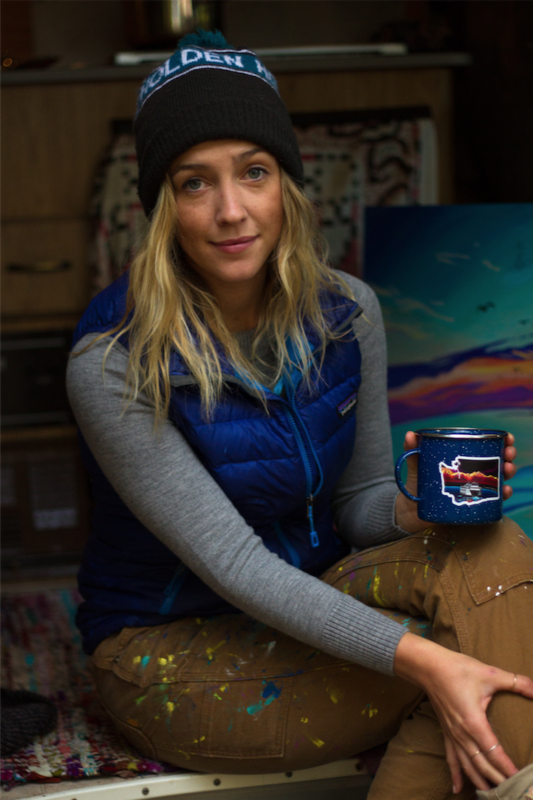 A PNW native, my paintings are heavily influenced by my love for the outdoors in addition to the simplicity and peace that I experience in nature. Though the mountains and outdoors have been apart of my identity from day one, my artistic pursuits began several years ago during college in Bozeman, Montana, when on a whim I enrolled in an art class. I had no idea what I was doing, but that didn’t seem to matter. My fascination with art grew- enough to stay in the art studio all night once all of the other students had left, struggling to master a little piece of a painting. However, my love story with art did not fully develop until I had a terrible mountain biking wreck in July 2015, resulting in a broken back, broken teeth, and abrasions covering my body. Suddenly I found myself stripped of the freedom that I was accustomed to experiencing in outdoor sports and adventures. Confined to a hard plastic back brace for three months, I spent my recovery at the easel, finding solace and freedom in painting my favorite mountains instead of climbing them. Since, art has changed my life. It provides essential balance and perspective to my outdoor pursuits. It has helped me grow into a healthier, happier, more grateful version of myself. By sharing my art along with my story, I hope to inspire others to practice what they love and to move forward towards their dreams- Even when they seem out of reach!